Between our “Artisanal” cookbooks and the from-scratch recipes we share here on the blog, you might get the impression that we don’t buy, use or otherwise eat prepared foods. That’s not quite the case, and to suggest otherwise would be just plain inaccurate. While the vast majority of our cooking and baking is in fact from scratch, our pantry is stocked – if lightly – with some “standard” foods that come in handy when convenience, time, or motivation are at a premium. Consider pasta sauces. Yes, we make our own marinara sauce from scratch. But we also like to have a jar, maybe two, in the pantry. When we need to throw together a quick, easy dinner, gluten-free pasta with jarred sauce is a no-brainer. Especially when such a meal is easily “fortified” with some fresh vegetables (diced peppers, zucchini, whatever), or some freshly cooked ground turkey (to make a bolognese), or maybe some sauteed shrimp in garlic. However, when we do go the route of the jarred sauce, we want it to be a) tasty, and b) consistent with the types of sauces we’d make ourselves at home. By both measures, the pasta sauces from La Famiglia DelGrosso just may have hit a home run, and we don’t toss around such praise lightly. Over the years, many brands of pasta sauce have graced our pantry shelves…both big-name brands such as Ragu and Classico, as well as natural, organic brands such as Muir Glen. A very small handful have been winners. Some have been good. But more have left us dissatisfied. They can be oily, or taste like glorified tomato paste, or have a flavor profile that just didn’t match our tastes. The fact that we’ve bounced from brand to brand for so long should be an indication of our general state of displeasure. Until now. 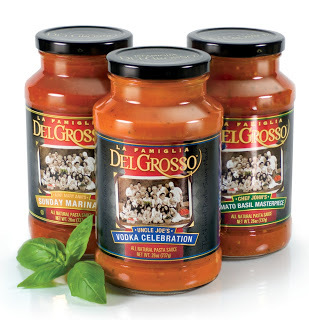 Founded in the 1940s by an Italian-American family, La Famiglia DelGrosso bills itself as the “oldest major family-owned manufacturer of pasta sauce in the United States.” They do one thing – make pasta sauce – and do it very well. LFD’s full line of 8 pasta sauces is all gluten-free. A handy nutritional table on their website also makes it easy to identify Kosher, vegetarian, vegan, and no-sugar-added varieties. The company sent us 3 gratis samples to review: Uncle Joe’s Vodka Celebration, Uncle Fred’s Fireworks Sauce, and Aunt Cindy’s Sun-Dried Tomato Sonata. We immediately fell in love with the familiar all-natural ingredients. Making pasta sauce at home, we wouldn’t do much differently. Take the Fireworks sauce as an example. It contains: whole Italian plum tomatoes, crushed tomatoes, olive oil, zucchini, fresh onions, organic sugar, sea salt, garlic, basil, crushed red pepper, and white pepper. That’s it. Aunt Cindy’s Sun-Dried Tomato Sonata – Warm, well-rounded, nicely-balanced flavors. A definite cheesiness to this sauce, though not overpoweringly so. That said, with the heavy cream and pecorino romano, it proved just a touch too much dairy/cheese for our sensibilities. Uncle Fred’s Fireworks Sauce – Superb. Great, bright flavor, with a good bit of heat. It proved too spicy for Kelli and the girls, but it was right in my sweet spot. Loved it. Uncle Joe’s Vodka Celebration – Rich, bright flavor, with just a touch of subtle heat. Didn’t taste cheesy at all, despite some cream and pecorino romano in the ingredients. In some ways, a blend of the best characteristics of the previous two flavors. The overall family favorite. Our search for a pantry pasta sauce is over. La Famiglia DelGrosso has earned a spot with our famiglia. And with 8 gluten-free, tasty, natural variations in their line of sauces, they just might earn a spot with your famiglia, too. Have you ever tried Aunt Mary Ann’s Sunday Marinara? Was curious how that was…..
Is it safe to use for nut allergy person?